Susan Blue Galloway received a B.A. in Fine Arts in 1973, from DePauw University in Greencastle, Indiana. She studied pottery there under Richard Peeler. She earned an M.F.A. (Master of Fine Arts) in ceramics from Wichita State University in 1975 and began to show her work in regional exhibits and galleries. After graduate school, Susan became the pottery instructor at McHenry County College where she started, developed, and taught the pottery program. In addition, she taught sculpture and 3-D design. She was on the faculty at M.C.C. 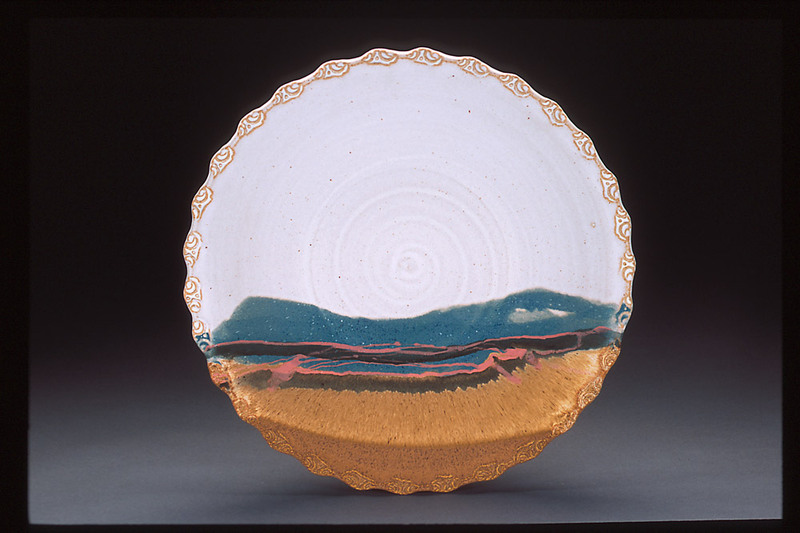 since 1976 and retired in 2009, but has been an exhibiting potter since 1975. Now that she has retired from teaching she works part time in our Studio. After 20 years of teaching, Susan went back to school, and in 1997 received an M.F.A. in Visual Arts from Vermont College at Norwich University. Susan is a founding member of the Clay Worker’s Guild of Illinois. This non-profit organization is designed to educate the community about clay work, and provide local potters with a network of other amateurs and professionals. She is a past president and current member in the Guild. Susan currently exhibits in local galleries and regional art shows. She has won many awards for her functional work, has done workshops, has been a judge and or juror at many art fairs in Illinois, and now has won awards for her sculptural work as well. Robert was born in Chicago, Illinois in 1948. He received a B.F.A. degree, majoring in design, from Northern Illinois University in 1972. While teaching and directing a craft therapy program at Elgin Mental Health Center, he continued his education and received a Master’s degree in Ceramics in 1977. He is presently a studio potter in Franklinville just outside Woodstock, Illinois and has been working with clay since 1968. 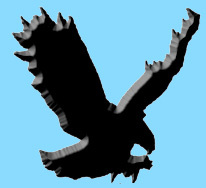 Robert started Blue Eagle Pottery in 1972 and participated in art fairs nationwide from 1965 until 2008. He annually did some 25 or so exhibitions and won over 50 awards for his efforts. He has also been invited to over two dozen one-man exhibitions by museums and participated in 60 competitions throughout the United States. His work and statements have been published in such magazines as: Ceramics Monthly, Greater Chicago Craftsmen Guide, Chicago Magazine, Better Homes and Gardens, The A.R.T. catalogue, Southern Living Magazine, Northwest Quarterly, McHenry County Living Magazine, and a cover feature in Sunshine Artist Magazine. He has received 4 grants from the Illinois Arts Council. He was treasurer of the Clayworkers’ Guild of Illinois for 20 years. Recently he became part of McHenry County Made program and his work was on Bon Apatite, a national TV show. Since 1999 he has transitioned to wholesale, online, and studio sales only. His work can be found in several museums, numerous private collections in every state of the Union as well 17 foreign countries. Besides the gallery above his studio, 30 shops and galleries represent him across the nation. The work produced by Blue continues in the tradition of craftsmanship passed along from Master to Student. He received a heritage that insists on an intimate relationship between form and function. From the European Masters to Blue Eagle Pottery, an inspired, reflective philosophy of art is carried on. The sun and the planets, the earth and the moon, the molecules of atoms, cosmic forces revolving in time and space are all the same, yet each unique. The tactile quality of roundness becomes a powerful means of communicating the craftsmanship of being centered. Centered clay on the wheel, centered in daily life and centered in spirit. Each piece centered the same way, yet unique. 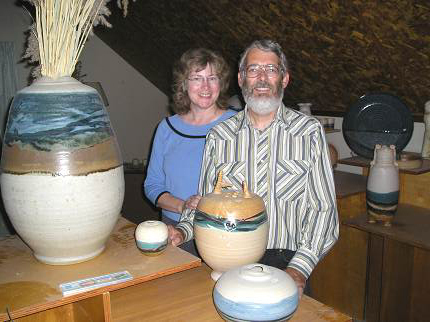 Robert Blue and Susan Blue Galloway, a husband and wife team, work in their studio together. Married in September 1982, they began building their studio in May 1983, which became operational in 1984. The Gallery opened in 1986. Their love of pottery is evident in their work. Their love for each other brought Shannon (1988) and Alex (1990) into the world and a family was created. The Gallery is opened whenever we are home. Tours and purchases are by chance or appointment. We are here a lot, we work and live here. My work is always available on the web site or through the shops that display my pottery from New York to California.